Last fall when our district Art department was learning about African cultures, a middle school teacher who had visited South Africa spoke to us about her trip. 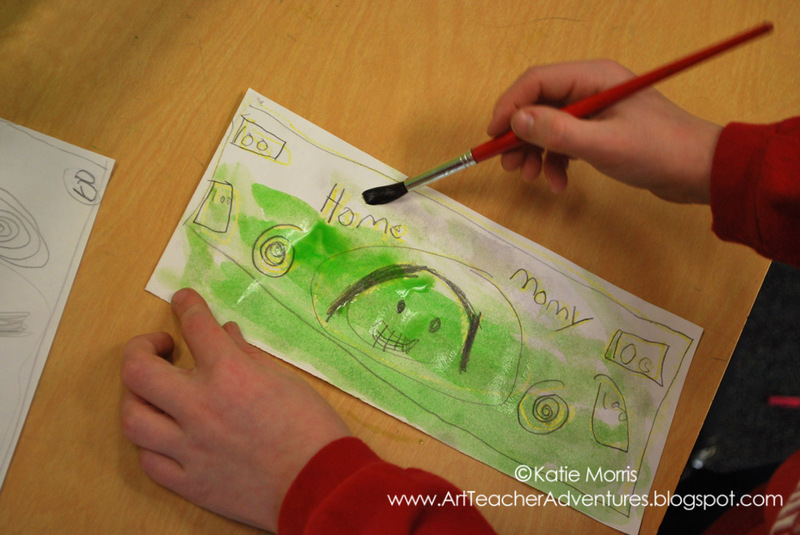 She shared a lot of interesting/inspiring information, but what stuck out most to me to inspire an Art lesson was a comment she made about their money. She showed a photo of bills from South Africa and said (I'm paraphrasing here) "We have dead presidents (and Ben Franklin) on our money, they put animals because that's what is valued." The idea of money not just being valued, but showing what is valued stuck with me. We spent time looking at money- REAL money when I passed out $1 bills for observation and images of currency from the US and other countries. We watched a video about how US bills are designed and printed (careers in Art, people! ), compared US bills to South African bills, and came up with features that are common in most printed money before the students designed their own bills showcasing what they value. I've decided to embed the complete lesson and post some of the resources we used below, as well as student work. The video above is Field Trip to the Money Factory- it was created by Kids.gov and shows interviews with a banknote designer (talks about symbolism) and a script engraver. These were the required elements of the students' designs. I think if I teach this again, I may try using colored permanent markers for the details instead of crayon. A lot of the first graders struggled with wax-resist. Some didn't press hard enough with the crayon and some scrubbed when painting and practically dissolved their paper. They were very proud of their money and couldn't wait to take them home to show their parents. I would also like to try this with older students sometime. I bet 5th and 6th graders could make some awesome designs. I let the students pick whatever amount they wanted their bill to be worth. If I had realized sooner that 1st grade works on number recognition to 100, I would have asked that they choose a number 1-100 to integrate some of their math curriculum. Cool lesson. My son was in South Africa a couple of years ago and he brought back a variety of rand and I was struck by the beautiful animal images on them. 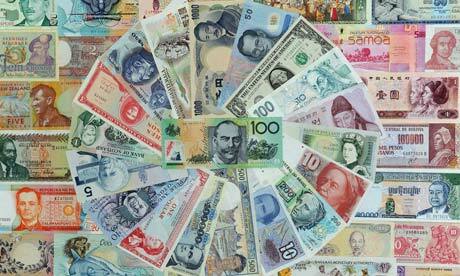 I like the concept of putting what has value to yo on your currency. Thanks, Phyl! South Africa seems like a really beautiful country. 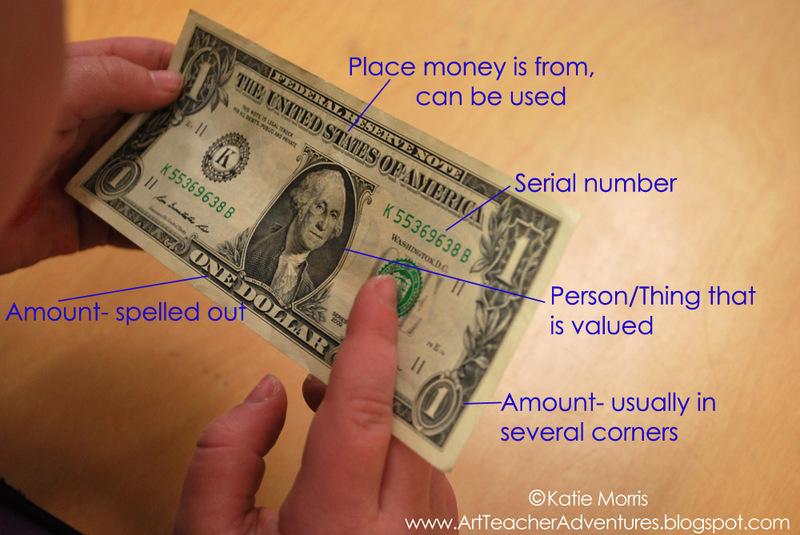 When I took Econ, I knew the right time to use money/currency- now I can't remember how to keep the vocabulary straight since they are used interchangeably! Love this idea. Your blog is great, I'll be back to visit often!